A campaign was launch in Saudi Arabia to cut down the high wages of domestic helpers or household service workers (HSW) following the austerity measure of the Saudi government. The wages of housemaids have been standardized at SR2,000 a month. Saudi women campaigner feel that SR2,000 (P26,000) is high salary and it should be cut down to SR1,000 (P13,000) especially when the income of Saudi families has diminished gradually as a result of austerity measures. Saudi women have formed a group that is asking Saudi families not to pay salaries higher than SR1,000 to their maids. The Saudi women's group also wants to stop the monopoly of housemaids who work illegally after running away from their sponsors. 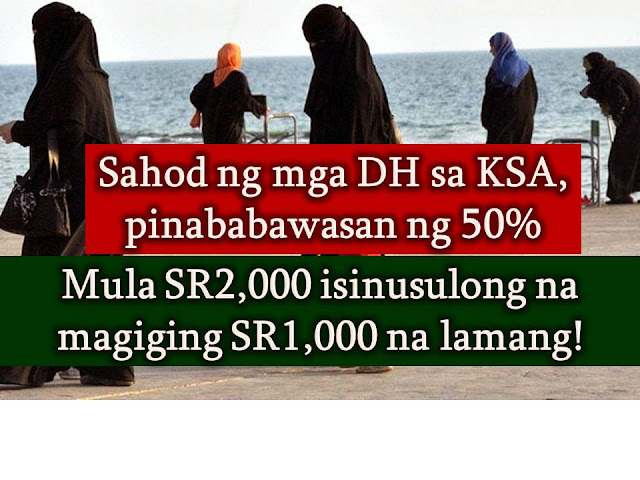 As of now, there are 40,000 Filipina domestic helpers in Saudi Arabia. Last 2012, a bilateral labor agreement is signed by Department of Labor and Employment (DOLE) Secretary Rosalinda Baldoz that sets the minimum salary of Filipina domestic helpers in Saudi Arabia to US$400 and entitles them to a weekly day off, an annual holiday of at least 30 days, the right to keep their passports, and a strict 9- hours-work-per-day policy. Because of the said agreement, deployment of Pinoy DH in Saudi has increased from 11,000 in 2013 to 30,000 in 2014 and then 70,000 in 2015. According to Recruitment Consultant Emmanuel Geslani, the number has down to 40,000 due to the oil crisis.